In the back bathroom of the house on Liberty Road, one of Liberty Township’s firefighters throws a bail of straw on the fire to get the flames rolling up across the ceiling and out the window for other firefighters to go in and fight. As the flames came out the window, one young spectator asked Chief Tom O’Brien what the temperature was inside the house. “It’s about 1,500 degrees,” he told the boy. Once the old house became structurally unsafe, Liberty Township Fire Chief Tom O’Brien gave the word for everyone to clear out of the structure and to “let it go.” That gave Jeriah Hanf, a student firefighter, a chance to learn what’s it’s like to control the front of the heavy water-filled hose as he worked with Firefighter Neal Brock behind him holding the hose down for him. 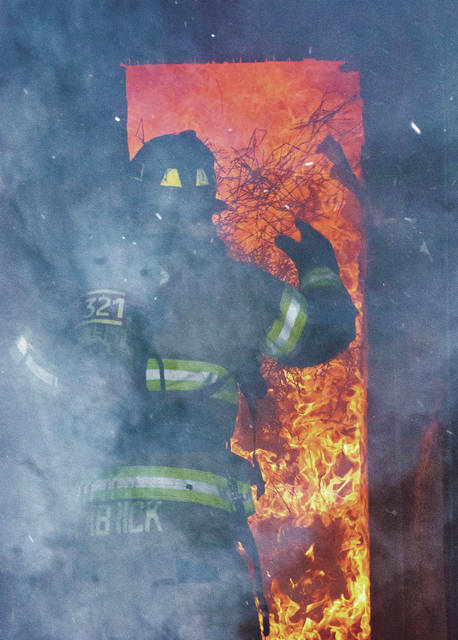 “It gets hot in there,” exclaimed one Liberty Township firefighter through his oxygen mask to Fire Chief Tom O’Brien as he exited a training fire in June on Liberty Road. But before the first bail of straw is lit to get the training rolling, there are hours of preparation put into the donated structures to make them a reasonably safe training environment and as environmentally friendly as possible. Liberty Township Firefighter Jason Miller said it took 20-plus hours of preparation time to make the two-story house with a cathedral ceiling in the living room ready for the June 26 burn. Miller has had previous experience in prepping a structure for a training burn. According to O’Brien, before burning the house, which was donated by Rockford Homes, five different departments were able to participate in rescue training. He said it’s good to bring in the other departments because the different departments in the county assist each other when needed. “It’s good for the guys to train with each other,” he said. O’Brien added local fire departments weren’t the only ones that were able to get in on the training. He said the Ohio Environmental Protection Agency was able to get in some training also. Before a burn can take place, fire departments must comply with Ohio EPA standards and obtain all the necessary permits. 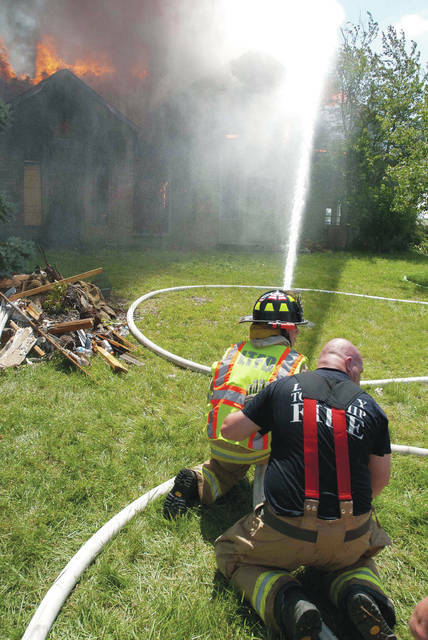 Last year about this time, Liberty Township was one of the local departments able to train with the Delaware City Fire Department when it was given several former homes across from Kroger and Walmart off of U.S. Route 23 for live training burns. Currently, infrastructure is being installed for a new shopping center and residential area that is to be built on the property. At that time, Capt. Jim Oberle said, there are a great many worries associated with working in the empty houses because the firefighters don’t control the fire the same way they do in a training facility. He said it takes hundreds of hours to prepare a building for a safe training fire. Oberle said the process that fire departments go through in preparing a building for a burn is the same process as any contractor who is going to demolish a building. He said there is a lot of leg work going into the preparation before fire departments can step onto the grounds. Oberle said once the burning starts, firefighters only get about three hours of burn training time out of each building. This entry was tagged D. Anthony Botkin, Jason Miller, Jim Oberle, Liberty Township Fire Department, Live Burn, Ohio EPA, Tom O’Brien, Training. Bookmark the permalink.